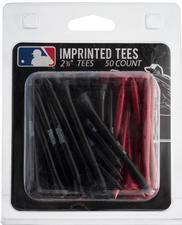 MLB 50 Count Golf Tee Pack (Regulation 2-3/4' Tees) (All 30 Teams Available) - $9.99 - GolfersEdgeOnline.com - Best Golf Equipment On The Web! Tee up your next ball with the Team Golf 50 count Tee Pack. This pack contains 50 team-colored tees, each with a team logo imprint, so you can show off your team pride on the course. Everyone will know you're a MLB fanatic when you get the Team Golf 50 count Tee Pack. If you have any more questions about the MLB 50 Count Golf Tee Pack (Regulation 2-3/4' Tees) (All 30 Teams Available); do not see the model you are looking for; need custom options; or prefer to not purchase online, then please call us at (630) 656-1291.